1900 Series consists of eight (8) models—the GS1900-8, GS1900-8HP, GS1900-16, GS1900-24E, GS1900-24, GS1900-24HP, GS1900-48 and GS1900-48HP. Providing GbE switches with powersaving functions, fanless design and full IPv6 support ensure your network to be ready for future expansions. In addition, the PoE models GS1900-8HP/24HP/48HP Gigabit switch complies with the IEEE 802.3at Power over Ethernet (PoE) Plus standard. 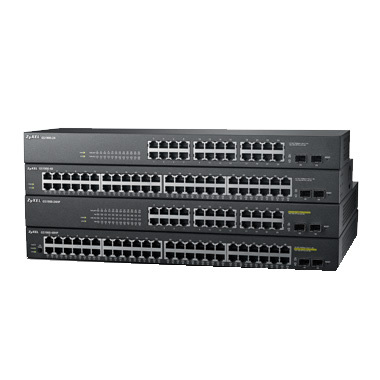 The complete GS1900 Series has been designed with useful features and advanced performances that empower your networks with speed and security as well as silent operation in your office environments.